You know how it goes: You start something new – like a dance class, crafting, studying a language, one of those oh-so-trendy Coursera classes – and find that you rock at starting something. Ok, I’ll speak for myself: I rock at starting stuff. I can start stuff like nobody’s business. I have a knack for picking things up. In French class in high school, it was easy for me to imitate the teacher’s throaty accent in the first few lessons. In capoeira class, I could manage playing berimbau toques (rhythms) and singing together with relative ease. In most dance classes, I can pretty much rock the intro week with the basic steps. Did I freaking kill that tendu or what?! But when intro week runs out is when my problem starts. I was initially worried about being, like, “the old lady” to a room full of 18-year-old classmates. Thankfully, both classes are full of a range of ages and experience levels…hooray for an all inclusive and supportive environment! But now I’m starting to feel what I often feel after starting a new endeavor: the beginner syndrome. My first pair of new ballet shoes since I was too young to vote. You know: when things start to actually get difficult. I’m old enough (or maybe just smart enough) to realize that nothing worth doing is easy or simple, that mastery of something takes time, and of course – beginning is easy; continuing is hard. So now, in week four of class, I’m frustrated that I forget to maintain my turnout in a tendu when my mind is focused on a particular warm-up sequence, or that my knee goes totally wonky when we do the one with the frappés (which sadly have nothing to do with frosty coffee beverages). 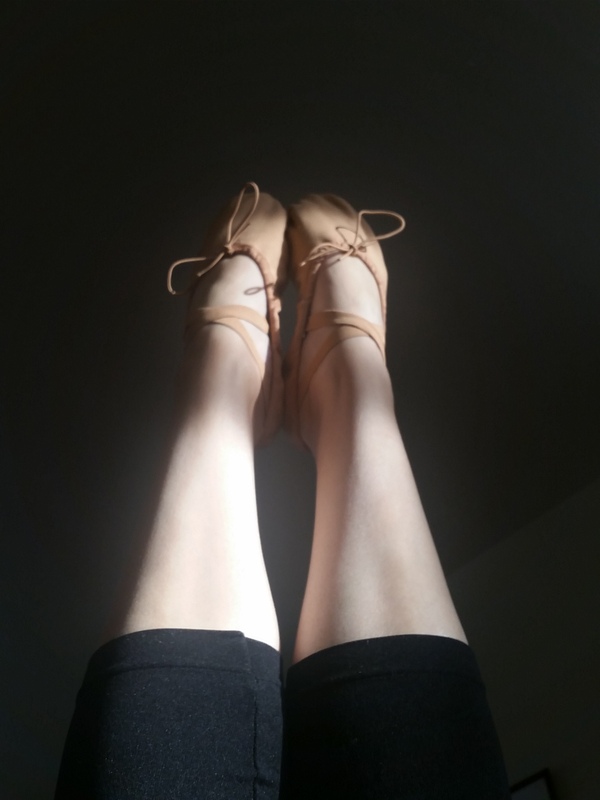 So I get frustrated with my sloppy beginner legs, with their shaky muscles being used in new ways; with my wobbly ankles and feet that can’t quite stay balanced all the time. Because I want to do it perfectly NOW. That’s ridiculous, of course. Even though the good little student in me wants to master the movement immediately, I know that just trying to master the movement is the point of why I’m taking the class – being a master is not. For as much as I’m a person who tells people that they need to enjoy the journey and forget about the destination, to embrace the now rather than dreaming about the next…I really need to start listening to myself. Maybe the smarter part of me signed up for these classes for exactly that reason. What can you enjoy learning today, rather than dreaming of being a master tomorrow? ← Acting Your Age: What does it mean…and does it matter?